Soon, when little kids roll into school with their rosé-colored crayons and avocado stuffed toys, they'll be saying, "Darling, let's totally do Brunchables!" Kids who grew up in the 1990s will surely remember the taste of decadent slices of processed ham and American cheese piled high on a buttery cracker or that faintly tomato-tasting pizza sauce smothered on a doughy bread-like crust with a sprinkling of cold mozzarella cheese. Yum! This month, the nostalgic childhood meal-snack from every grocery store's refrigerated section is getting a breakfast-style makeover in the form of three new meal kits called "Brunchables." Honestly, what took them so long? 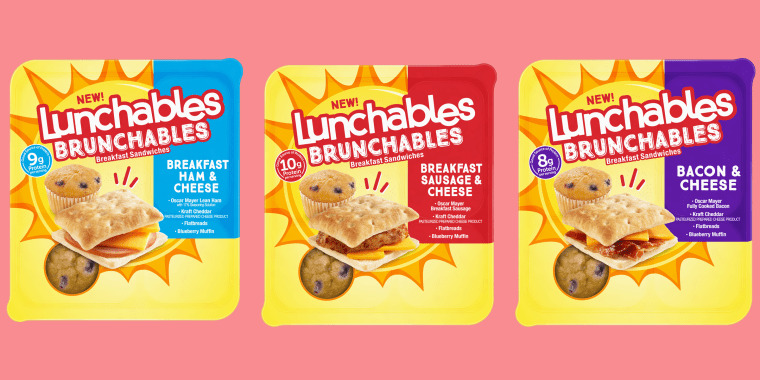 On Monday (which was also April Fools' Day), the Lunchables brand, which is owned by Kraft Heinz Foods, posted a photo of the new concept online. While many insanely excited millennials responded to the tweet assuming it was a prank, the company came back with an even better surprise: Brunchables are real. Fans far beyond grade school were champing at the bit to start brunching ... cafeteria style. They are truly all about it. Some brunchers even provided a little drink inspiration. does this come with a capri sun mimosa pouch? We could totally get on board with a mimosa-flavored Capri Sun. Too far? We think not. In addition to shocking followers with the reality of Brunchables' impending release, the brand announced it will allow 100 lucky people to get a sneak peek at the breakfast packs by putting their name on a "brunch wait list," starting Tuesday. How exclusive. Brunchables will come in three varieties: Breakfast Sausage and Cheese; Bacon and Cheese, and Breakfast Ham and Cheese. Kraft Heinz says all flavors will begin rolling out in supermarkets this month with a suggested retail price of $1.99. Talk about an affordable brunch!